girl and parents are driving to their new house. she is moody cos she has to leave all her friends behind. on their way, the father took a shortcut that led to a deadend. they decide to explore the place and found an abandoned amusement park of sorts. the parents found a stall and sat down to eat. moody girl didnt want to eat so she went off on her own. by the time she came back, her parents had been turned into pigs. 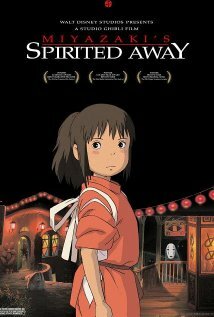 haku comes to her aid and helps her find a place in the spirit world, so that she can attempt to rescue her parents and leave the spirit world one day. my score: 10 out of 10.
best of hayao miyazaki's anime movies. lots of themes, lots of beautifully hand and computer animation. fabulous storyline that keeps you engrossed from start to finish. i know this is a review of an old movie, but this is cos i just re-watched it for the nth time. it's that good. it's a keeper.